Two litters are planned for autumn 2005, one from Ch. Sequoyahpark Eye O' The Storm, NAJ ("Trouble"), and one from Ch.Outburst Legally Blonde ("Skipper"). Dreamworks--Border Collie breeder: with dogs from champions. 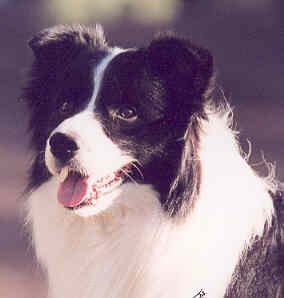 Border Collie breeder in the greater Philadelphia, Pennsylvania, USA, region. Owner of top winning show dogs. Visitors welcome by appointment. Breed information and links to Bayshore, Blue Chip, BonniDune, Borderfame, Clan-Abby, Corinlea, Darian, Glentress, Korella, Majestic, Outburst, Sequoyahpark, Sycamore Oaks Ranch, Tonalee, and Wizaland Kennels. Copyright 2003 Dreamworks Kennels. No portion of this web site may be reproduced, printed, or copied, by any means or technology, except as indicated on each page. This includes photograhs, graphics and text. This is an original work solely owned by Rebecca Foulds. Requests for reprints or copying should be directed to me at: RRF2208@aol.com and approved requests will be put in writing. Graphics that are linkware from other designers are indicated on each page and you should contact the individual designers (via the links provided) for permission to use their works. I have tried to give appropriate credit for all works used that are not part of the public domain. Please notify me if you feel there has been any omission of credit.